Rally here! Join millions of players in SMITE, the online battleground of the gods. Whether this is your first Multiplayer Online Battleground Arena (MOBA) game or you’re a seasoned veteran, the competitive action and irreverent mythology will make you a believer. Come with us, and leave your mortal world behind. This is SMITE, an online battleground where the Gods of Old wage war in the name of conquest, glory, and eternal battle. Whether this is your first Multiplayer Online Battle Arena (MOBA) game or you're a seasoned veteran, the intense action and irreverent mythology of SMITE will make you a believer. SMITE has a game mode perfect for whatever mood you’re in. Play our traditional, premiere 5v5 competitive mode – Conquest. Or have some fun as you learn the game with our “deathmatch” mode, Arena. Test your skill in 3v3 Jousts or 1v1 Duels on our new, Chinese-inspired map. Push down lanes in a Mayan jungle with Siege. Or if you only have a few minutes, play a streamlined version of Conquest in Clash. Play as one of 70+ Gods and unleash each deity’s unique strategies, legendary weapons, and earth-shattering powers. Lift Mjolnir, the mighty hammer of Thor, the Norse God of Thunder. Let the heavens rain lightning down upon your foes as Zeus, Greek God of the Sky. Wield the power of bees (Yes, bees) as Ah Muzen Cab, the Mayan God of Bees. New Gods come out all the time, keeping SMITE fresh. SMITE is a top 10 eSport, handing out more than $5 million in prize money to players just like you. Play your way up the ranks. Become a Grandmaster. Join a competitive team. And maybe, one day, you too could be playing in front of a sold-out crowd at the annual SMITE World Championship. Never played a MOBA before? Don’t worry. SMITE has leagues and ladders for every level of play. And auto-buy and auto-level let you jump right into the action without worrying about items and skill builds. PlayStation(r)Plus Members get this FREE, exclusive skin for SMITE! Wield the mighty storms of Kukulkan, Mayan Serpent of the Nine Winds, with his KuKu4 skin. Only PlayStation(R)Plus members have access to this limited-availability God skin. This item also unlocks Kukulkan for use in the Battleground of the Gods. 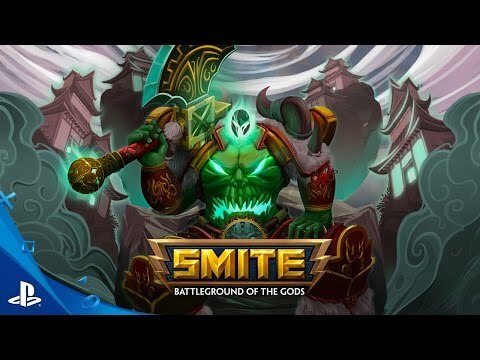 Battleground of the Gods is a trademark and SMITE and Hi-Rez Studios are trademarks or registered trademarks of Hi-Rez Studios, Inc. in the United States and other countries. All trademarks referenced herein are the properties of their respective owners. The trademarks of Hi-Rez Studios, Inc. and others may not be used without the prior written consent of the trademark owner.